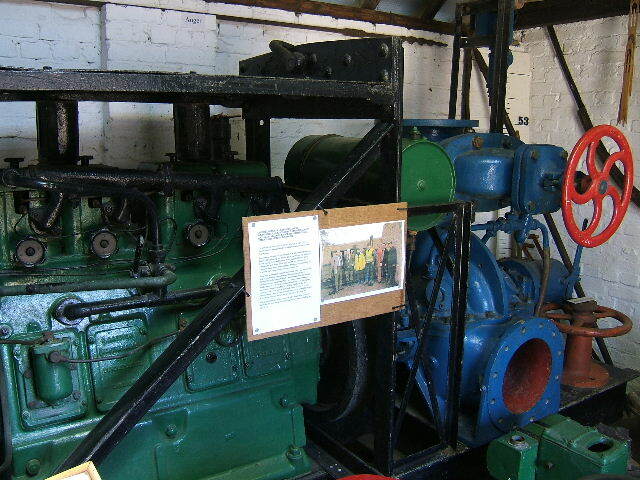 The Diesel Pumping Set, comprising a 12″/12″ Horizontally Split Casing Gwynne Centrifugal Pump Coupled to a Lister JP4 38 Horsepower Diesel Engine with Rotary Exhauster for Priming. This Unit was kindly donated to Ramsey Museum in early 1987 by Sawtry Internal Drainage Board who had previously used it for local Fen Drainage. Considerable research was carried out by F.W. Missin in 1987 into the history of this pumping set. We now know the the unit was purchased by the Mersey Docks and Harbour Board after the 1939-45 War, when considerable work was done on the Central River entrance, and Langton/Canada improvement schemes. The pump unit was one of several used for dewatering large excavations etc. These were substantially complete by the mid-1960’s and the unit was sold in July 1965 as surplus to requirements and purchased by Thomas Mitchell & Sons of Bolton, who reconditioned the unit and subsequently sold it to Purser Plant Ltd., contractors of Old Kent Road London in 1970. No details have been found of its subsequent use before it was purchased by Sawtry Drainage Board but it is believed to have been used in the Middle Level in the early 1970’s at Laverburn Fen Farms and subsequently removed to Mr Findlay’s farm at Great Ravely from whence it was collected for the museum. Alongside is a picture of the volunteers who installed the unit in the Pump Room. Note it required removing the roof before installing the unit in situ.